Queer. Writer. Activist. Philosopher. Trauma Survivor. Accomplice. Today, in a nightmare fit for Friday the 13th, President Donald Trump will become the first sitting president to address the controversial Values Voter Summit and the first modern president to speak before (and arguably endorse) an anti-LGBT hate group. The summit, which the Southern Poverty Law Center (SPLC) described as a “rogues’ gallery of the radical right,” is hosted annually in DC by the conservative Christian group the Family Research Council (FRC), which has been classified as a hate group. Trump, a thrice-married adulterer who bragged about sexually assaulting women, was invited to be the keynote speaker by the FRC, an organization intended to “advance family, faith, and freedom.” And though that hypocrisy is stunning, Trump is in like company with this virulently anti-LGBT hate group. With friends like these, who needs hate groups? Trump touted himself as a friend to the LGBT community during his presidential campaign but has since waged a war on gay rights. On the day of his inauguration, the administration erased all references to LGBT people, gay rights and all of those living with HIV from whitehouse.gov. The administration has left LGBT questions off the U.S. Census, revoked protections for transgender students, banned transgender people from serving in the military, and failed to protect LGBT employees from workplace discrimination. Last week, Sessions released “religious freedom” guidance that declared people and businesses should be free to discriminate on the grounds of religion. This guidance amounts to a license to discriminate against the LGBT community at the workplace, in housing, and in public accommodations. Roy Moore, the GOP Alabama Senate candidate. Moore, who previously stated homosexuality should be illegal, notably refused to answer a question about whether homosexuality should be punished by death, stating that he “doesn’t know.” Unsurprisingly, Moore has ties to an extremist pastor who has no problem saying that queer people should be put to death. After instructing state employees to ignore the U.S. Supreme Court ruling in favor of marriage equality, Moore, now backed by Trump, was suspended as a state supreme court justice. Again. Steve Bannon, former White House chief strategist. Bannon, a noted white nationalist who bragged that he made Breitbart into "the platform for the alt-right,” gave Phil Robertson an award after his anti-LGBT remarks. Under his leadership, Breitbart routinely used homophobic and transphobic slurs, intentionally misgendered transgender activists, and featured vitriolic anti-LGBT figures. Not to mention that he is a racist, antisemitic, sexist with white supremacist sympathies who has had a dangerous influence on the current administration. Steve Scalise, the House Majority Whip. Scalise owes his life to a heroic lesbian officer who saved his life after he was shot in June. One of his first actions after recovering from the attack is to give a speech to the Family Research Council, working tirelessly to take away her rights and safety. Tony Perkins, Family Research Council president. Perkins has claimed that gay men are more likely to molest children. This is false. He has claimed that LGBT rights advocates intend to round up Christians in "boxcars." He has also argued that homosexuality is a result of mental illness and supported debunked conversion therapy treatments, which have been compared to torture and leads to an increase in LGBT suicides. Mat Staver, founder and chairman of the hate group Liberty Counsel. Staver has stated that he would personally advocate for disobedience to the U.S. Supreme Court if it voted in favor of marriage equality, comparing supporting marriage equality to “turn[ing] over a Jew in Nazi Germany.” His group claimed the brutal murder of Matthew Shepherd (19 years ago yesterday) was not an anti-LGBT hate crime but rather a bungled robbery. By speaking at the Values Voter Summit, President Trump is lending the power and credibility of his office to these hate groups and their activities. He is endorsing not only the effort to treat LGBT Americans as second class citizens without basic protections, but also the very real threats of violence and death posed by these people, organizations and ideologies. We must loudly condemn and reject the supposed values of those who threaten the lives, safety and dignity of vulnerable members of our communities. Hate is not an American value. 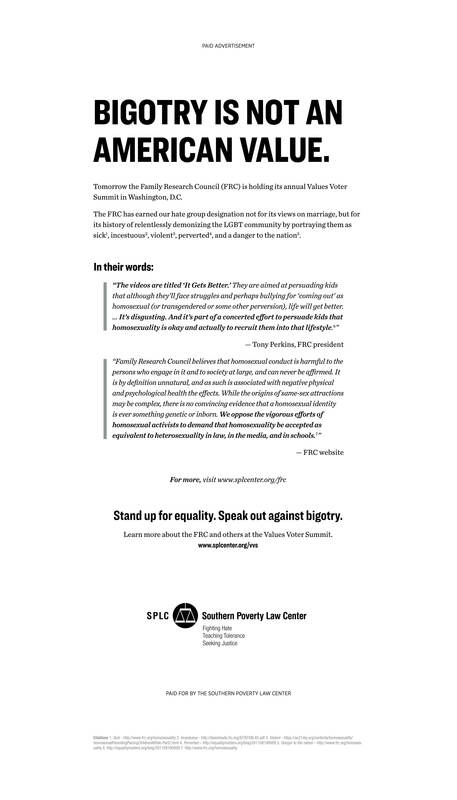 Download and share this image from the SPLC. Learn more about 10 Ways To Fight Hate.